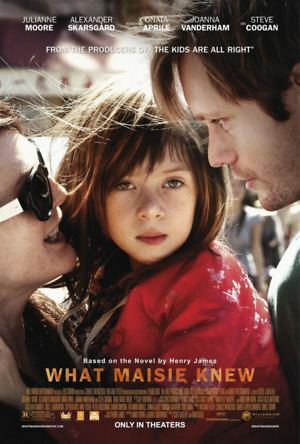 Young Maisie (Onata Aprile) is caught between her feuding parents, Susanna and Beale (Julianne Moore and Steve Coogan), as they go through a bitter custody battle. The thing that makes What Maisie Knew special yet also kind of heart-breaking, is that Maisie is our eyes and ears as the whole film is from her point of view. She sees the fights between her parents, she sees her mother spending more and more time making music, and she sees what’s going on between her father and her former nanny Margo (Joanna Vanderham) before just about anyone else. It’s sad because the reason she notices what’s going around her is not because the adults in her life are bad at keeping secrets, but it’s more like they forget she’s there, and that while she’s young, she still has a mind of her own. Maisie’s relationship with Margo and Lincoln (Alexander Skarsgård), her mother’s new husband, is incredibly sweet and touching. What Maisie Knew shows how there’s more than one kind of family and it can be one where there’s no blood relations at all. As the film progresses more and more secrets are revealed, and Maisie becomes less innocent as she goes through some turbulent times. However, she never truly loses her child-like wonder with the world even when she begins to see her parents as real, flawed people at a much earlier age than she should. Onata Aprile is a very talented young actress, she more than holds her own when she’s in some emotional scenes with Julianne Moore, who’s also great in this. What Maisie Knew is a touching film, full of powerful performances and compelling relationships. It’s a great drama that can be tough to watch at times but that makes it all the more special. 4/5.